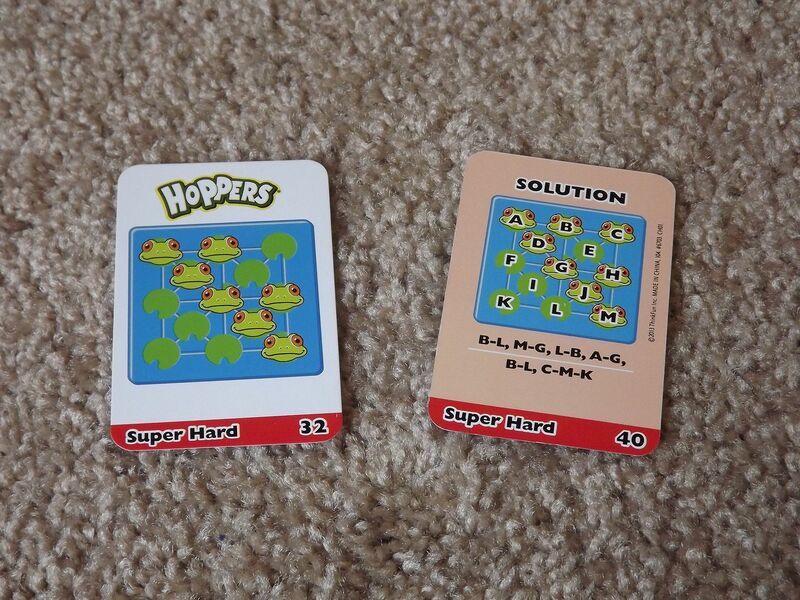 We received a complimentary ThinkFun Hoppers Peg Solitaire game for kids to facilitate this review. All opinions are our own. With a mission to build reasoning and creative thinking skills through play, the company ThinkFun has developed a variety of games for people of all ages that, as they state, ignite the mind. Originally founded by a husband and wife team 25 years ago, the company has continued to develop and provide games that have received numerous awards and exceed safety requirements. 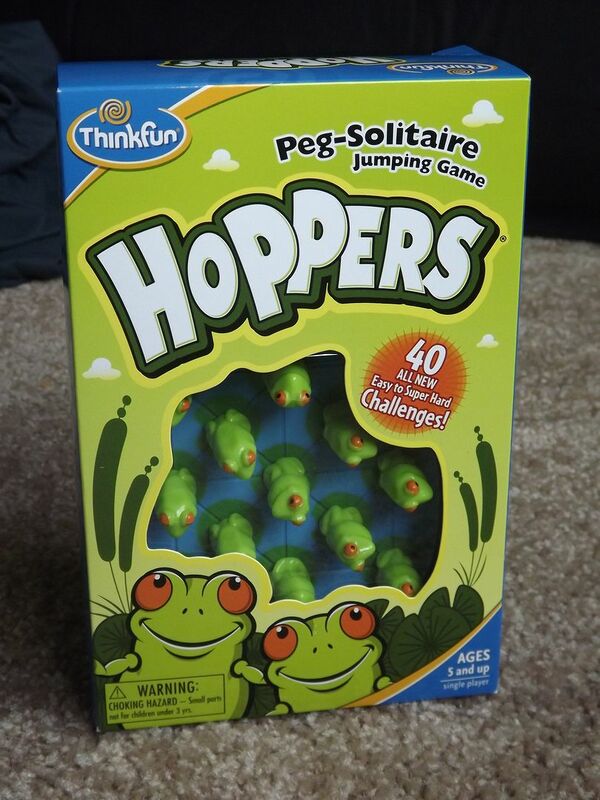 The Hoppers® Peg Solitaire Jumping Game for kids is marketed for ages 5 and above. It consists of a small game grid that is about the size of a drink coaster. It has a built in storage drawer that holds the included 40 challenge cards and 12 hopper frog pegs when not in use. The challenges on the cards range from easy to super hard. Each card shows colorful pictures of each challenge as well as how to solve them on the opposite side of the card. My son was eager to open this game and see what it was all about. As a five year old, the easy cards were challenging, but once he had a better grasp on the concept of the game they got a little easier. It was simple for him to follow the graphics on the front of the cards that showed how to set up each challenge. 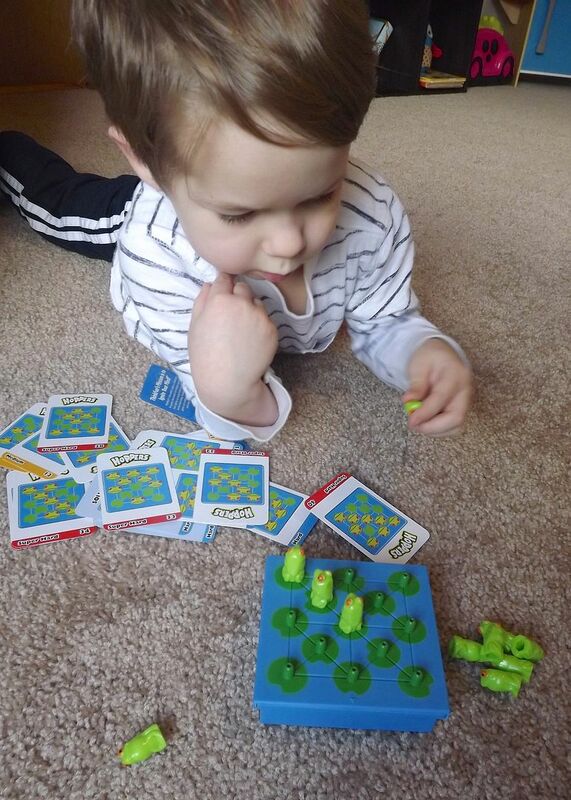 This game quickly taught him trial and error, and critical thinking in terms of how to strategically jump each frog so that there would only be one remaining. As a parent, it was pretty cool watching the gears turning in his head as he tried to solve each challenge. Now, there were a few times when it became too tricky for him and he got frustrated or wanted to give up and put the game away. I didn’t necessarily see this as a negative strike against the game, but that it was in fact providing him a challenge. While that wasn’t necessarily ideal for my son, it showed me that he was being forced to use that big old brain of his! Because this game states that it is for ages 5 and above, I went ahead and tried a few of the challenges out myself. I have to admit, the super hard challenges can get pretty tricky and I had to consult the back of the card to find the solutions on a couple of them. So this game is definitely one that builds critical thinking skills for children and adults alike. When it was time to put the game away it was super simple for my son to stack the cards and place them in the built in storage tray. He could then store each hopper peg in the storage tray as well. There was a little prong for each peg, and I appreciated how this kept the pieces secure so they wouldn’t just fall out of the grid the next time we opened it. The Hoppers® Peg Solitaire Jumping Game retails for $14.99 on the company’s website www.thinkfun.com. There you can also check out more on the history and mission of ThinkFun and see a wide variety of games they offer. Are you a teacher or a therapist? ThinkFun also has game bundles and resources for teachers, and several games specifically recommended by therapists to aid children with special needs. Looking for a fun game for older kids? Check out our review of ThinkFun’s Last Letter game for kids! My 3 year old would love this game! I have never heard of it till now but I am headed over to check it out now! Thanks for sharing it will be great for her Easter Basket! This looks super cute. My little boy is 4 years old and I think that he would have a lot of fun playing this with me. My Kids Are Just Going To Love This Game! Lisa Jones recently posted..Walgreens Match Ups 4/6! My kids love games. I have never heard of this one before. My children will love this game! My 3 year old said ribit ribit! !